Step 1: It’s the borrower’s responsibility to pay contractors directly if they require funds up front to begin rehab. Step 2: The borrower is ready to be reimbursed for completed work and submits the Draw Request Form – available here – to the lender. Please provide property access info (i.e. lock box code) and a working phone number so the inspector can call you. Step 3: The inspector calls the borrower to confirm a time and date of the inspection. They must have interior access as well. We recommend that either the borrower or project manager is present at the time of the inspection. Step 4: The inspector performs an inspection to verify that the items requested on the Draw Request Form have actually been completed. The inspection report is sent to the lender for approval. Step 5: The lender compares what was requested on the Draw Request with what was actually performed at the property. Funds are available to the borrower by check, ACH or wire transfer ($25 fee). Turnaround time is typically 3-4 business days from the Draw request to the borrower’s receipt of the funds. 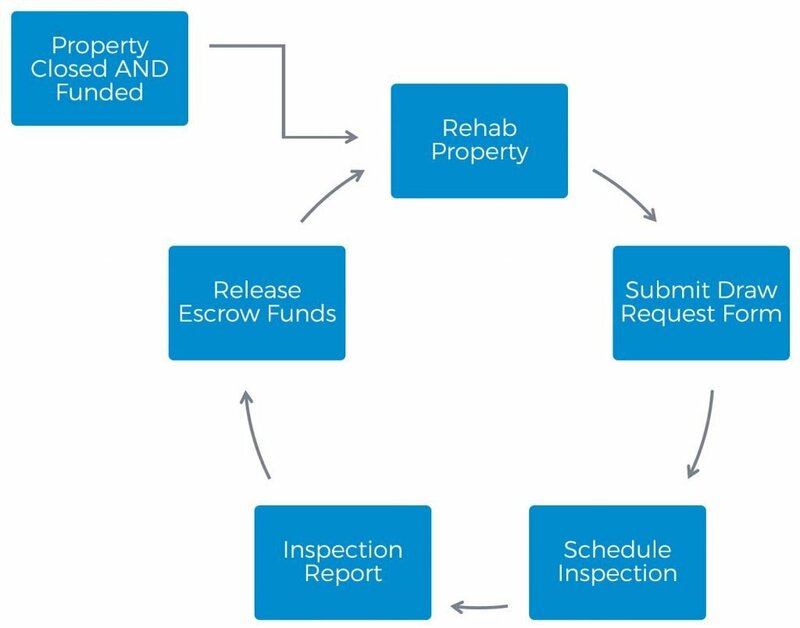 Inspection Fees: Our inspection fee (which varies from market to market and scope) will be deducted from the escrow rehab account. The borrower can request as many inspections as needed, but no less than 60 days from the closing of the loan or the previous inspection. NOTE: Bay Mountain Capital does not release funds for work that has not been performed, including the start of rehab. If you have any questions don’t hesitate to call us at 214-953-3188 Ext. 18 or email us at draws@baymountaincapital.com.